The update is already rolling out for the Verizon Galaxy S8 and S8+ users, if you can’t see the update on your phone, then you can flash the update manually on your phone with the help of the ODIN flash tool. Below is the full working method to Update Galaxy S8 and S8+ With Android Oreo. So let’s take a look and download the official OREO update on the Samsung Galaxy S8 and S8+. This guide is only for the Snapdragon variants Galaxy S8 and S8+ users. And works on Galaxy S8 (SM-G950U) and S8 Plus (SM-G955U) models. So before following the below mention method do check the model of your phone and follow all the steps one by one on your phone. 1. Download the ODIN zip file here to flash the firmware on your phone. 2. Now download the full stock firmware Odin file for your model from the above mention links and unzip the folder on your desktop. 3. Now its time to boot your phone in download mode. To do this power off your device then hold the Bixby button + Volume down + power. 4. Once your phone in download mode. Connect to the PC with USB cable and run the ODIN exe file the same files that you downloaded in step 1. 5. Click the BL button and navigate to your Odin firmware folder where you extracted your files, and then click the file starting with BL. Do the same for AP, CP. 6. Now hit the start button to start the flashing process. 7. Once the software version is flashed successfully on your phone, your phone will reboot. 1. Once the phone is booted. Save the OTA zip file in your phones SD card. 2. Now boot your phone in recovery mode. First turn off your phone and hold down the Bixby button + Volume up + power. 3. Once your phone in Recovery mode. Select “apply update from SD card.” You can select this by using your volume rockers to navigate and the power button to select. 4. After selecting that option, find the file called “update.zip” and select it with the power button. Now the OTA update will flash on your phone. If you don’t have the SD card on your phone, then use this method. Here you need a Windows PC and ADB drivers. 1. Install and Setup the ADB drivers in your PC. Now you will see the ADB folder on your Windows C Drive. 2. Now Save the OTA update zip file in the ADB folder. 3. Now boot your phone in recovery mode. First turn off your phone and hold down the Bixby button + Volume up + power. 4. From here select “apply update from ADB” and then connect your phone to the PC with USB cable. 5. Now go to the ADB folder and in the address bar of ADB folder type CMD to open the commands prompt windows on ADB folder. The file name is the name of ZIP file that you saved in the ADB folder. 7. Now the flashing process will start on your phone, and this will take some time to install Android Oreo on Samsung Galaxy S8/S8+. That’s it. 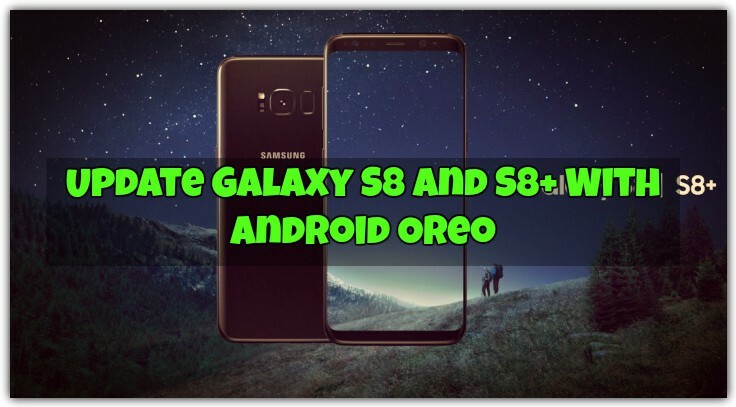 Now you successfully installed the latest build of Android OREO on your Samsung Galaxy S8 and S8+.